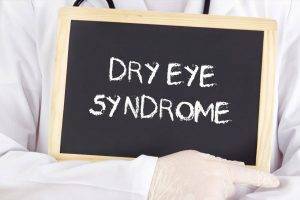 Persistent dryness, scratchiness and a burning sensation on your eyes are common symptoms of dry eye syndrome. These symptoms alone may be enough for your Northwest Columbus eye doctor to diagnose dry eye syndrome. Sometimes, he or she may want to measure the amount of tears in your eyes. A thin strip of filter paper placed at the edge of the eye, called a Schirmer test, is one way of measuring this.